Better Putting: Can You Improve on the Green without Regular Practice? Better Putting comes from learning what to do and then practising how to do it. When you practise, you must practise with purpose with each practice putt counting. Part of the fun of golf is learning how to score better. However, you won’t get the maximum enjoyment out of your game unless you are willing to practise. It is essential for you to build up a smooth repeating stroke. Equally important is to keep it that way. Only with regular practice will you be able to develop the confidence you need to succeed. According to Patrick Campbell in his book How to become a Scratch Golfer 97% of all golfers believe that next time out, for reasons to be analysed in the bar, they will play the game of their lives. They see no point in practising. Better Putting is not achieved by merely thinking about it. You must first learn the basics and then systematically practise what you have learned. Although you can rush the act of learning, the absorption of learning is a much slower process. Another stumbling block to rapid success is that after you learn the basics, you will forget them and will have to re-learn them time and time again. Discovery of, and subsequent loss of knowledge, is a never-ending process in golf. However, re-learning comes more easily than learning. 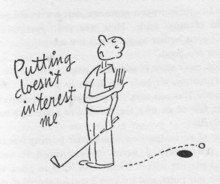 Don Herold published an amusing book titled Love That Golf with the purpose of helping the many golfers who lead lives of quiet desperation. He comments that 'Improvement comes to plateaus when you will show no progress and may even show regression.' However, he notes that if you study the game, you will come out eventually on a higher level. So the reality of getting better is that you can’t do it without practice - and not any old practice. You must practise with purpose. Knocking a few balls around the practice putting green on the odd occasion is pretty much a waste of time. You must treat each practice putt as if it counted. The more you can replicate what you will experience out on the course, the more you will build your skill and pass it into a habit. There are a number of putting drills and they are well-described in monthly golf magazines and books of golf instruction. You should keep in mind that just one week of practising your putting will do more to improve it than months of just reading what to do. Short sessions are better than long sessions as boredom and fatigue will set in and you are likely to lose your focus. Dave Pelz believes that putting on a practice putting green is not the best place to hone your skill for accuracy as you often get incorrect feedback. It is preferable to putt on a true surface such as a putting mat. There are also a number of indoor putting aids such as 'The Rail' by Harold Swash that can help you to putt straight. That said, the only place you can realistically practise distance control is outdoors. Better Putting is achieved through learning and regular practice. You have a choice. Either practise your putting or learn to accept your results philosophically if you putt poorly.